In June 1930, Thomas C. Hedden, Director of WLAP, reported, "In July 1929, the property (WLAP) was acquired by the American Broadcasting Corporation and on Independence Day of that year the first commercialized programs were released. Since its formal opening, when it was operated on thirty watts of power, it has made rapid strides, and has pioneered the way in many phases of broadcasting in Kentucky." Great expectations were in the offing as the facilities for the power increase were being constructed. The fulltime affiliation with CBS would bring WLAP's listeners the following personalities: Walter Winchell, Will Rogers, Paul Whiteman, Heywood Broun, Chic Sales, Jesse Crawford, Ben Pollack, Jean Carroll, Ted Weems, Duke Ellington and scores of others. On May 20, 1941, WLAP-FM was granted under the call letters of W51SL on the frequency of 45.1 Megahertz, but was not built. On January 9, 1946, a second grant was received for 102.3 Megahertz, and again was not built. On June 21, 1950, a third grant was received on 94.5 Megahertz and went on the air October 24, 1950, which is the frequency WLAP-FM [now WMXL] operates on today. In 1939 WLAP joined the Mutual Broadcasting System which provided a more varied news service to the public and a variety of other programs. This was enhanced by WLAP's personnel and UPI Wire Service. WLAP news personnel were; J. E. (Ed) Willis, Tom Downing, Phil Sutterfield 1937-1939 and 1943 until the late 1940's, George Jesse, Frank Ellis, and announcer, Goodloe McDowell. The livestock market reports were broadcast daily from the Producers Cooperative Association Stockyard by Mr. Oney Cook or Mr. Crouch, and stock exchange reports were broadcast by Jack Castleman of the W. L. Lyons & Company. Some of the employees following the late 1930's were L. C. Redmon, 1953-1964, who began in Sales and became General Manager; Ann Jones, 1954-1962, had the popular "Talk of the Town" program, designed for the housewife-homemaker, that received wide recognition; Frank Faulconer, 1949- 958, had the early morning show co-hosted with June McCulloch, the first female disc jockey in Lexington; J. B. Faulconer, 1940-1955, handled sports play-by-play on the Ashland-Aetna Oil Sports Network, and hosted the Romance of Kentucky Quiz Show in addition to sports news reports; Doris Hotlzclaw, 1940- 1957, as Receptionist and then Traffic Director; John Sutterfield, 1941-1944, studio engineer-announcer, who was on duty December 7, 1941 when the wire service carried the report of the attack on Pearl Harbor; Ralph L. Hucaby, 1942-1943, studio engineer; Henry C. Locklar, 1943-1957, in engineering, and became Chief Engineer about 1945. 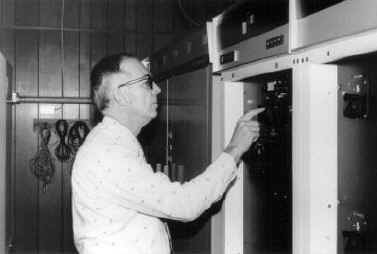 He was responsible for the installation of the directional antenna system in 1950, which consisted of some 5000-feet of air-dielectric transmission line and 230,000 feet of copper wire for the ground system, in addition to transmitters and audio equipment. Dave Parry, a student at the University of Kentucky, visited WLAP to play their piano, became Music Director and Program Director. Mignon Doran produced and announced special Women's programs which were broadcast coast-to-coast, as well as locally. The NBC network was released in 1971, in preference to becoming a CBS network affiliate. Later, RKO network's No. 1 and 2 and some programs from the Mutual Broadcasting System network were added. WLAP programs with "Adult Contemporary" music, while WLAP-FM has programmed with "Adult Stereo Rock" music since 1974, and both are complemented with a news staff reporting local area news and news feature programs.